Hi I am a small show breeder and I have 2 puppies for sale. I am not a puppy mill!! I have 3 adult dogs in my house all who get tons of love and attention. All my babies are raised in my living room and are around people all the time. They are affectionate and loving because they have been cared for gently and with extra love. I have 2 champion dogs and 1 girl who comes from an extensive line of champions. 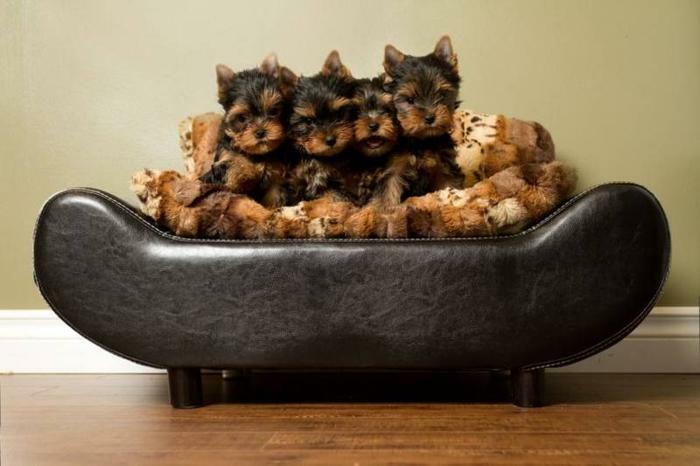 I care about the pups my kennel is raising and if I didn't think their parents were healthy, I would not breed those parents.You have my word that I do my best to embedder the yorkshire terrier breed by breeding to C.K.C. standards. If you think buying a yorkie for a cheaper price is worth it consider where puppies are raised, if the breeder really cares about what the puppies turn out like, why they are breeding, how many dogs they have, what kind of dogs do they come from, if the breeder has pet morals and cares about the life of each dog in her kennel, if the breeder is constantly learning and updating her own knowledge on animals. etc... Quality is worth a price! There are 2 girls available. They will be ready for their pet homes on Jan 21. I can deliver as well. Puppies come with everything tails docked, health agreement, vet checked, c.k.c. reg. etc... They have been well socialized with people of all ages and other dogs. Please call as my internet is down 306 396 Female puppies are pet price.